Now that is interesting! I saw a Lebanese Cigarette on the line called Supars, its logo was very close to the ubiquitous Cedars brand. 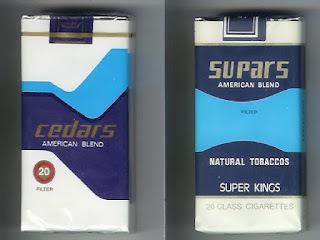 Cedars logo seems more italic and a bit more thin but the resemblance especially in the colors used on the box is uncanny. Yes there are differences, but they both seem to stem from the same design.